Welcome to Recipe Thursdays! I said I was going to do recipes again once a week, and here is the first one I've done in a while. I haven't cooked much lately, but I have a huge backlog of food photos and recipes I've made and wanted to post. Hopefully, some of you find something delicious to cook for dinner with these posts! The first recipe, is something I made last week while I was staying over at B's parents' house, we had some extra chicken thighs and I've been wanting to make this recipe for a while. As always I adapted the recipe to suit my needs, so that's the recipe I will post, with the changes I made. But feel free to use the original instead, or use your own adaptation! Cooking shouldn't be about following directions to the T, but instead doing what feels right to you, and making changes you feel is right for the recipe. Or changing things to save time! I do that a lot. 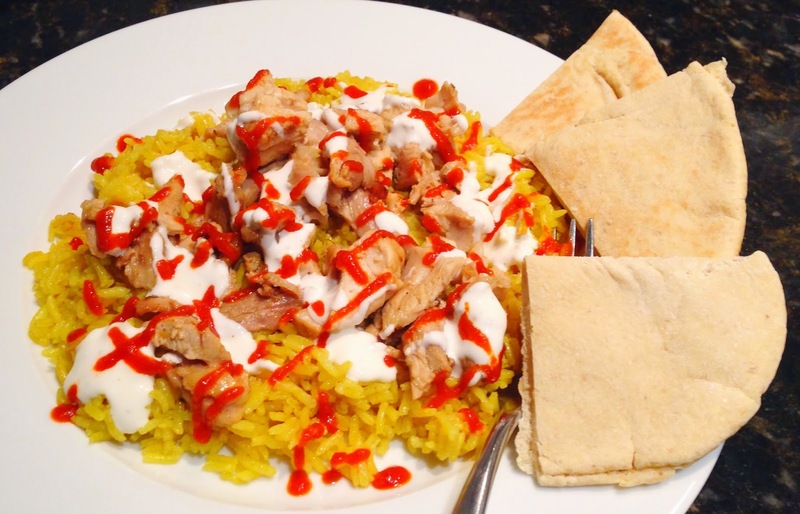 Here's the recipe for Halal Cart-Style Chicken and Rice with White Sauce. From what I've gathered, halal cart chicken and rice is quite popular in Manhattan. This is an easy to make spin on a classic chicken and rice dish, and it doesn't take too long to make! 1. For the chicken: Combine the lemon juice, oregano, coriander, garlic, and olive oil in a big plastic bag. Season the marinade to taste with kosher salt and black pepper. Place the chicken in a 1-gallon zipper-lock bag with the marinade. Turn the chicken to coat, seal the bag, and marinate the chicken in the refrigerator for at least 1 hour and up to 4 hours, turning occasionally to redistribute the marinade (see Note). 2. Remove the chicken from the bag and season with kosher salt and pepper, going heavy on the pepper. Heat the oil in a 12-inch heavy-bottomed cast iron or stainless-steel skillet over medium-high heat until it is lightly smoking. Add the chicken pieces and cook without disturbing until they are lightly browned on the first side, about 4 minutes. Using tongs, flip the chicken. Reduce the heat to medium and cook until the chicken is cooked through and the center of each thigh registers 165°F. on an instant-read thermometer, about 6 minutes longer. Transfer the chicken to a cutting board and allow to cool for 5 minutes. 3. Using a chef’s knife, roughly chop the chicken into 1/2- to 1/4-inch chunks. Transfer to a medium bowl, cover loosely with plastic, and refrigerate while you cook the rice and prepare the sauce. 4. For the rice: Melt the butter over medium heat in a large Dutch oven. Add the turmeric and cumin and cook until fragrant but not browned, about 1 minute. Add the rice and stir to coat. Cook, stirring frequently, until the rice is lightly toasted, about 4 minutes. Add the chicken broth. Season to taste with salt and pepper. Raise the heat to high and bring to a boil. Cover, reduce to a simmer, and cook for 15 minutes without disturbing. Remove from the heat and allow to rest until the water is completely absorbed and the rice is tender, about 15 minutes. 5. For the sauce: In a small bowl, combine the mayonnaise, yogurt, sugar, vinegar, lemon juice, parsley, and 2 teaspoons black pepper. Whisk to combine. Season to taste with salt. 6. To serve: Return the entire contents of the chicken bowl (chicken, marinade, and all juices) to the skillet. Cook over medium-high heat, stirring occasionally, until heated through. To serve, divide the rice and toasted pita bread evenly among three to four plates. Pile the chicken on top of the rice. Top with the white sauce and Sriracha. Note: Do not marinate the chicken longer than 4 hours or it’ll get a mushy texture. If you must delay cooking the chicken for any reason, remove it from the marinade, pat it dry with paper towels, and refrigerate until ready to cook. Let me know what you think of Recipe Thursdays and the Halal Chicken in the comments!